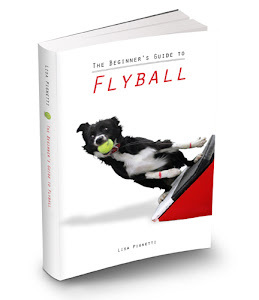 Dear flyball, how've you been? I was just working on the chapter about Flyball Equipment, and the section about flyball boxes has me a little bit stumped. I could use your help. In the old days, people really could build a flyball box themselves in their garage from some plans they found in a book or on the internet. It was basically a big wedge of plywood with a single recessed hole drilled out of the middle. Obviously that's not going to cut it these days. Boxes have evolved into carefully crafted machines, designed for speed as well as safety. They're expensive. They're hard to find. You have to get on a wait list and it could take months to get it (for example, I recently contacted Eric Tindall about ordering a box for a teammate -- we love his boxes, they are beautifully made. He said he has a 3-4 month backlog right now.). Finding a good used box (especially right when you need it) is almost like winning the lottery. What are you guys telling newbies about flyball boxes (whether they are newbies to your club who want a box of their own, or a new club purchasing their own equipment)? Does anybody out there have box plans that they are willing to include in my book? Or a link to plans on their website that I can include in the appendix? I'm afraid to just tell readers to Google "flyball box plans" because right there in the top 5 results are antiquated designs from 1998... Any box makers out there want to be included in the appendix? The box makers I know of are Eric Tindall, Dan Phillips, Mike Miller, and Mike Freda -- who else is out there actively taking box orders? Is Norm Glover still making them? It seems like getting access to a flyball box is one of the biggest issues a flyball newbie has to deal with. Would love to hear your advice and thoughts. Dave Dubois (FastTrack) makes a very nice box. We actually have two people on our team that make boxes (which is how I bought an affordable one). For our competition boxes though, we purchase from elsewhere. I really think stressing the safety of the box for the dogs (angle, padding, hole placement, and firing speed/strength) are the big things. It would be great if you did a bit about the different styles of boxes found in flyball. I've seen the NAFA style, the curved front boxes (used over in England mostly), a hybrid between the two. Then there are two hole, three hole, four hole boxes. Hole size, padding size around the hole, etc. And then firing type, of course. It would be nice to have an explanation of the different options currently available so people have a basis of what to look for in box plans they do find or a used box they run across. I'd suggest that when they are ready to get a box they contact whoever organizes fly ball in their area. We've given away a couple of boxes (or so cheap as to be free) to people starting clubs in area's not represented near us. That's a good way to pick up a used box with a design that is still current but not necessarily the best. The price of a used box is going to make getting started a lot easier too. I wouldn't knock the "Wedge" just because of the age of its design. Functionally, it can be a pain to keep tuned. In use, it is a solid, fairly light, and durable box of simple design. But you have to stay on it to keep it functioning optimally. When we started, we borrowed a box until we had our own. I built a Mike Freda "DIY" kit, and ordered one. I did this because of the back log, more than a consideration of funds. But I did end up with two boxes that look, feel, and function the same for less than buying two finished boxes. When evaluating a box, make sure it doesn't sound like a bomb going off when a dog hits it. This can be detrimental to new dogs, and to dogs you are running against. Make sure the fit and finish are very good. Recently saw a dog get a toe caught in the ball hole on a newer, popular design. Lost her toenail. Make sure a little wear or fatigue doesn't alter the box's function. Most older boxes for sale out there just need a little TLC to function well, though some designs need more attention than others. The hardware for the older hammer style boxes is still available at the hardware store, and fairly easy to replace. Be careful about light boxes. I know your boxloader is always in your ear about the weight of the box, but it is the dogs who are relying on it to stay in place while they run into it at top speed. The box needs to stay in place when a dog hits it. I think you listed most of the active, popular box makers. I think Jim Sova is still making Spring Backs, you did not list him. I would have bought another Willoughby box but Mike Freda said he was having problems with shipping long distances - boxes were arriving damaged and I wasn't going to risk that much $, and I thought it would be too hard to find transport for a box across the continent. I emailed back and forth a lot with Mike about his DIY plan/kit. He said the latest version was getting rave reviews, but I decided we'd try the Fast Track box since it is lighter. Our 35 lb. Fast Track does not move when big labs hit it. As far as newbies go, I tell them to make hit it boards to practice at home. I bought a used box from a club in UT (I'm in PA) when we needed a 2nd box to run two lanes in practice. It cost as much to ship as the box itself, but at $160 total it was still a good deal just to have a 2nd box. It was an older Willoughby so it was similar to the one I already had. Now it's the designated box for not ready to race dogs to take home and practice on. I have owned the following: Glover box - 10 yrs ago, Freda box - 6 yrs ago, Tindall box - 4 yrs ago and now a Fast Track bought a few months ago. In between the Freda and Tindall my club purchased Premiere boxes but they lasted less than a year because constant issues and then the club bought Tindall boxes. My Glover, Freda and Tindall boxes were used in competitions with very little issue. A year ago our Tindall's started having some issues but with some adjustments they are better but now need constant adjustments to keep dogs from bobbling. I sold my glover box to someone interested in flyball and wanted a box. I still have my Freda box which I use to each classes and/or loan out new members. I am passing on my Tindall to a teammate in exchange for some items she paid for. At home I prefer to use my Fast Track. I love that box and the couple times I took it to practice the dogs ran awesome. If someone wants to look into flyball training and want their own equipment I suggest starting with a training board and suggest they look for used boxes to buy or if they may stick around I will loan them my Freda.